CN Times Books Inc., 9781627740050, 240pp. China's near miraculous economic growth over the last thirty years gives rise to a series of conundrums: How did China eclipse two hundred years of Western growth in three short decades? Why have money and wealth grown so quickly in China? Why does the Chinese stock market experience such extreme rises and falls? Why is it so difficult to control property prices? Why are high interest loans becoming more and more prevalent? 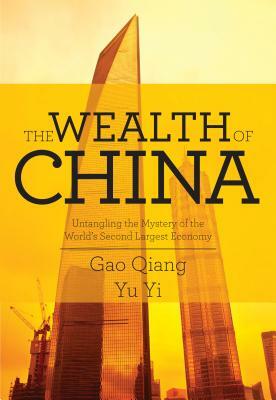 In The Wealth of China, financial observer Gao Qiang and economic scholar Yu Yi examine these and other questions in detail. From stock market bubbles to the prospect of financial deregulation, Gao and Yu combine their expertise to explore China's diverse and complex economy. Along the way, they untangle the central mystery of China's growth, with clear and candid commentary on a wealth of issues. Gao Qiang is a renowned economic commentator, and the deputy chair of the Chinese Society of Financial Journalists. He is the producer of China Central TV's (CCTV) popular entrepreneurial program Win in China! and the chief writer for China Memorandum. Gao is the author of the bestselling books How Wall Street Affects China and The Changing Face of Currency.Yu Yi is a well-known economic scholar, specializing in the research of macroeconomic and currency trends, as well as longer-term shifts in the general population. She has published several books, including Who Kidnapped Our Lives?, Who's Speculating in China?, and The Changing Situation—What Will Happen to China?